Have you ever wondered what was up with that secret "conspiracy" society of weirdos who randomly turn up at the end of Texas Chainsaw Massacre 4 (a.k.a. Next Generation)? I think "who the heck are they?" was a pretty universal reaction to that left-field plot twist. But I don't think a lot of people know, even TCM fans, that Kim Henkel - the writer and director of Chainsaw 4, and co-writer of the 1978 original - actually answered all of that in a follow-up film in 2012. 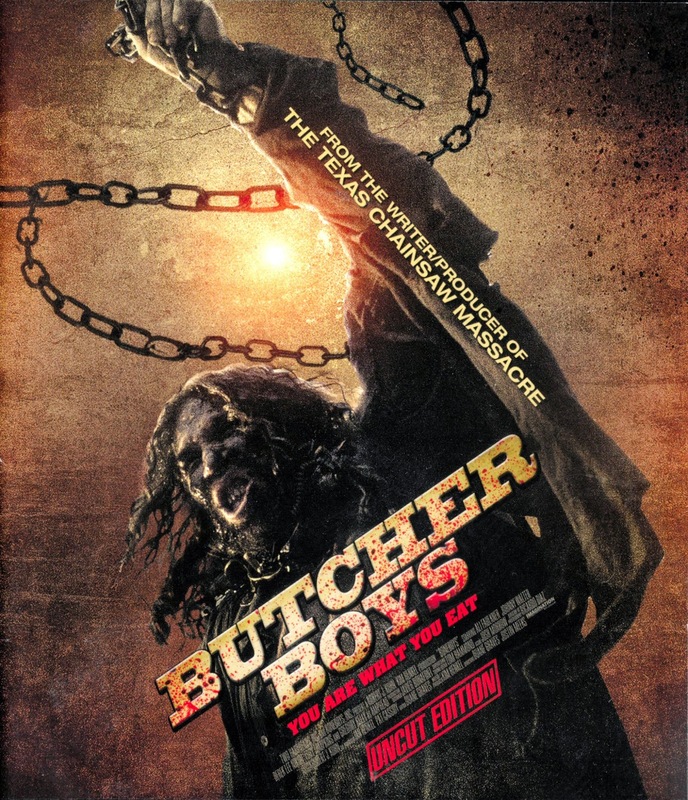 Because the Texas Chainsaw rights seem to be with those Platinum Dunes guys for the remakes, Butcher Boys is not an official TCM movie in name. But it is absolutely, 100% the next chapter in the story, and Henkel wants us to know that. ...And maybe even more that I missed. Henkel is clearly trying to signal Chainsaw fans here. He can't say it's Chainsaw 5, but it is. It's not even a recent screenplay. He updated it a bit, but this was written all the way back in 1995. It even says "Texas Chainsaw Massacre" in big letters right on the cover and poster, thanks to that "from the writer/producer of" credit. Besides just being another Texas Chainsaw, I actually think this is an underrated little film with an undeservedly bad rep. The film admittedly starts pretty slow. Nearly the first half of the film is four annoying teens being chased by a pack of "pretty boy" sadists. 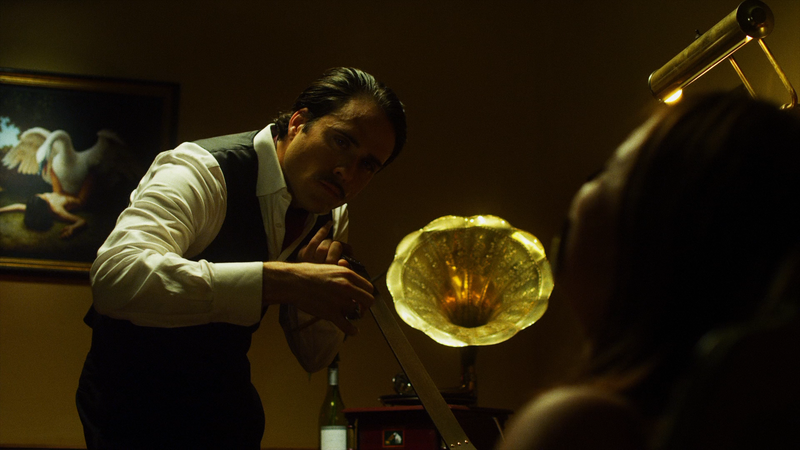 That admittedly drags on, but I still like how it's not afraid to get darker and more serious than most horror films. It's when we meet the rest of the "family," however, that the film takes off and gets fully gonzo, building to an over-the-top finale that goes far beyond any of the other films in the series. One of my favorite moments is when the father of one of the family's victims covers his entire body in butter so he can fit into a big crack in the wall where his daughter was taken. It's so insane; I kinda love it. 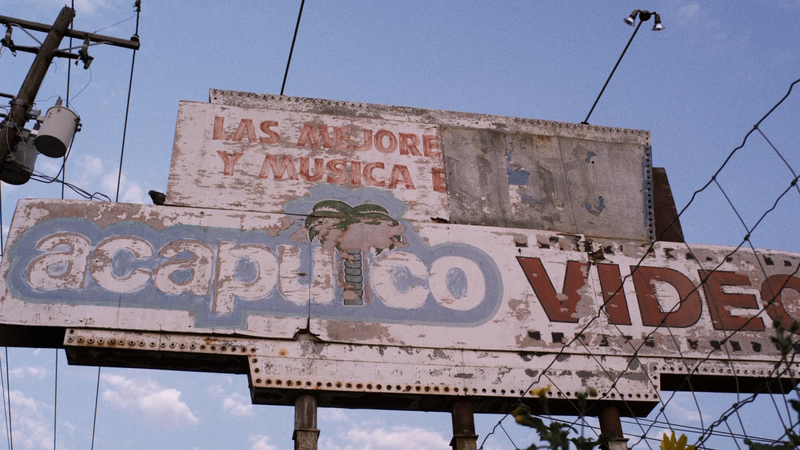 Before I oversell anybody too much on this film. though, I will say that a lot of people hated Chainsaw 4, and if you're one of those people, this won't turn you around. Everything there was to dislike about that one (and believe me, I see it) is here, too. Again, this film drags a lot for the first half. And the way the teens are written and directed is so obnoxiously unlikable, it's easy to be blinded by animosity towards the merits of the film. Inspired by Jonathan Swift's satirical essay A Modest Proposal this film also drifts into some real absurdity, which I quite liked, but will probably turn off most conventional slasher fans looking for another entry in a popular franchise. There are also a few cases of the "unfortunate CGI"s due to the film's low-budget you're going to have to overlook. So I wouldn't even necessarily recommend this to people who just generally consider themselves fans of the Chainsaw series overall. But if you liked Next Generation, you should definitely not miss out on this movie. I really like the look of this film; it feels like the Texan Nightcrawler. And the shot-on-digital footage is served quite well by this HD presentation. There's not a lot you can do to screw up a new digital film's transfer, and fortunately they don't go out of their way to do so here. Everything looks exactly as it should. The film is in its original 1.78:1 aspect ratio, and there's no interlacing, ghost frames or any problems. Wait, is he wearing the prom dress of the girl from TCM 4? The blu-ray is perfectly English friendly. Yeah, it has the German dub in HD DTS 5.1, but it still has the original English audio in HD DTS 5.1 as well. And while it says it's region B on the back of the case, I just played it on my region A-locked player. The only thing we miss out on is the theatrical trailer, which is only available with the German dub; but that's an inconsequential price to pay for getting the film in HD. That trailer is about it for extras, though (the US DVD doesn't have any either). The only other stuff on this disc is a collection of bonus trailers for: Junkie, Hunting Season, Kaliber 9, Home Sweet Home, Rites of Spring, Compliance, Sin Nombre - Life Without Hope, Antisocial, Sickle and Stalled. It has some pretty sweet packaging, though, with reversible artwork to hide the giant, unattractive "FSK 18" ratings symbol, and instead of the standard blue blu-ray case, it comes in a solid black one. I'm surprised how little recognition this film seems to receive for the Chainsaw film it is, even by the fans: Ironically, a lot of online commenters call it a TCM rip-off. I do understand some people not liking this film, though. Henkel's Next Generation was already the most controversial in the series; and this film doubles down on all of that. This film is the picture of Not For Everybody, but I do wish it would find its audience. The lame Butcher Boys title doesn't help. But there's something of value here, guys; I shouldn't be the only one to see it. 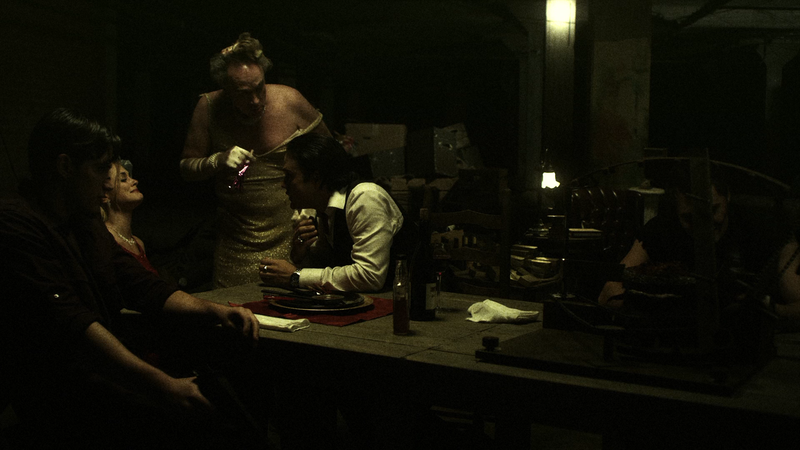 BUTCHER BOYS is much a mean spirited trainwreck that it(along with [the equally brain damaged] THE TEXAS CHAINSAW MASSACRE:THE NEXT GENERATION) displays why Kim Henkel should permanently Never be allowed near any movie cameras(of any kind). Ha ha Yeah, definitely only for fans of TCM4, which is a select group.